Dr. Wyss’s old machine workshop. The 2nd biggest castle in Switzerland overlooks Lake Neuchâtel, in the centre of Grandson, a historic and cultural town. The mediaeval town and castle of Grandson illustrate this area’s long history. Built in the 13th century, the castle played a key role in the Burgundian Wars against Charles the Bold. Now listed as a national monument, it houses collections of armour and crossbows as well as a more unusual collection of vintage cars. 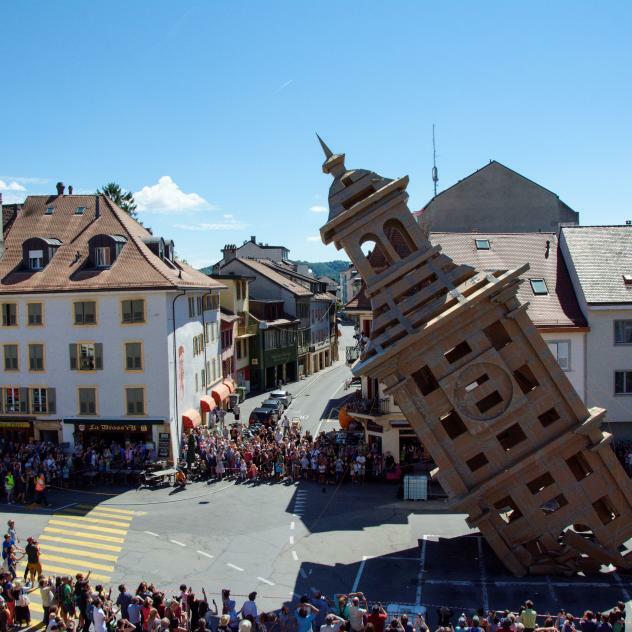 In August, the Mediaeval Festivals known throughout Switzerland are held here. Visit the Maison des Terroirs tourist office to sample local wines and products and Saint Jean-Baptiste Church, a fine and respectfully refurbished example of 12th century architecture. With a wide range of bike trails and surrounded by the Bonvillars vineyards, Grandson combines sport, culture, nature and fine living for a complete wine tourism holiday. Grandson bore witness to the famous battle of 1476 that opposed Charles the Bold and the Confederates. It is best explored starting from the castle, the second largest in Switzerland. As a classified monument of national interest, the fortress overlooks Lake Neuchâtel and offers a stunning collection of weapons, armour, crossbows and old cars. The most daring visitors will not miss exploring the wall-walk and the torture room. Although hardly any of the Burgundian spoils of war have survived, Grandson offers many hidden treasures. Whether for romantic cruise, a bicycle excursion or to admire the shores of Lake Neuchâtel, a cruise with an LNM ship is a soothing and relaxing experience. In summer, the landing jetties at Yverdon-les-Bains, Grandson and Concise are served from Tuesday to Sunday. Located above Lake Neuchâtel and a few minutes from Yverdon-les-Bains, the medieval castle of Grandson is Switzerland’s second largest château. Several collections, crossbows, weapons, armour and multiple workshops for adults and children add to the enjoyment of visiting the fortress. Located on the third floor of the Cornu Factory, the “bistronomical” restaurant Le 1424 offers revisited, rediscovered, local and seasonal produce cooked and served in a delightful modern, panoramic environment. A jewel of the Yverdon-les-Bains region and the second biggest Swiss castle, Grandson played a key role in the Confederates battle against Charles the Bold. Once vanquished, he fled and left many items of value at the castle. Some of these pieces and reconstructions are now part of the collection of weapons and armour. The church of St. John the Baptist, a monument of national significance and of rare beauty, is situated in the heart of the town of Grandson. Recently renovated, it owes its reputation to its remarkable Romanesque capitals. Dolmens, literally « stone tables » in old Breton, served the function of communal burial places for waterfront communities. This tomb was doubtless used for centuries by numerous generations as a resting place for their dead. This cellar offers a variety of performance events all year long. It has a capacity of 80 to 130 persons depending on room layout. Tours of the market town and the mediaeval church organised by the tourist office, provide an opportunity to discover their rich history. Le Corsaire is an old barge converted into a floating ‘polyvalent space’. Departing from the landing stages at Grandson or Yverdon-les-Bains, it takes visitors out on noiseless trips on all the three lakes of Neuchâtel, Bienne and Morat, going wherever their fancy dictates. Claude Jäggi offers an unusual and convivial experience: he drives families and groups in his carriage through the heart of the vineyards of Bonvillars, starting from Concise, Grandson or even Yverdon-les-Bains. A significant episode in our history, the battle of Grandson between Charles the Bold and the Swiss took place in 1476, on the shores of Lake Neuchâtel. Today, the battle field has been replaced by vines and verdant plains and a marked trail follows in the footsteps of the famous Bungundian Duke. Grandson, in the Yverdon-les-Bains region, is known for its imposing and fascinating mediaeval castle but also for the new kind of tourist office it offers. The Maison des Terroirs is not just a tourist information point but also a welcoming location where visitors and locals can come and sample local specialities and wines. The old Charteuse de La Lance, which hosts a cloister that has remained intact since the 14th century, is an exceptional historical monument as well as a wine estate. It is situated on the lake shore between Yverdon-les-Bains and Neuchâtel and is distinguished by its tranquillity and its radiance. The district of Bonvillars has been home to a wine cooperative since 1943. The winegrowers who are associated under the name “Cellar of Bonvillars winegrowers” centralise their production in recent premises that are open to the public. The exceptional terroir of Bonvillars in the Yverdon-les-Bains region has a series of marked trails where visitors can walk and discover what it has to offer. The wine cellars between Grandson and Concise welcome wine enthusiasts looking for excellent crus and red or white speciality wines. Situated on the shores of Lake Neuchâtel, a few metres from the landing stage at Grandson, the Restaurant des Quais, which features in the Gault Millau guide, welcomes the discriminating gourmet and fish lover. Its terrace offers a unique view of the southern shores of the lake and, in the distance, the Grande Cariçaie. The famous Cornu company at Champagne in the area of Yverdon-les-Bains opens the doors of its bakery for unusual tasting experiences. On offer are an interactive museum, flavour workshops and a gourmet stop at the “bistronomique” panoramic restaurant. The La Coudre Foundation estate in particular offers educational activities that raise the awareness of an audience of all ages with regard to heritage protection and conservation. It is a magical place, lost in time and situated amid beautifully preserved natural surroundings. On the last Saturday in October, the village of Bonvillars near Lake Neuchâtel holds the number one truffle market in Switzerland. A must for all foodies, this unique event dedicated to the Jura truffle is a chance to discover, buy and savour this exceptional fungus! Starting from Yverdon-les-Bains or Grandson, two solar-powered boats with a capacity of up to 12 persons each, allow environmental and renewable energy enthusiasts to discover the unspoilt and hidden secrets of Lake Neuchâtel. A relaxed, instructive and ecological experience. Every year, in mid-August, the public is able to relive the age of knights and chivalry during the medieval festival against the sumptuous backdrop of the Château of Grandson. Large numbers of passionate, enthralled visitors fill the gardens, courtyards and impressive halls of the castle. Every year, on the last Saturday in August, the wine growers of the Appellation Bonvillars organize a gourmet walking tour, combining wine-tasting sessions with meals produced from regional products. Located at Grandson, just ten minutes from Yverdon-les-Bains, the Salle des Quais is a modern space for organising seminars, receptions or cultural events. The nearby Lake Neuchâtel and the mediaeval city of Grandson are an inspiring backdrop for work sessions. The Pécos campsite in Grandson is ideally situated in a shady green location on the shores of Lake Neuchâtel. A direct access route to the lake has been created for nautical sports enthusiasts. Located alongside the Jura Ridgeway, at an altitude of 1164m, the Les Rochats restaurant is open all year. Two dormitories of 10 to 20 beds with sanitary facilities are available. Close to Mont-Aubert, in the heights of Concise, the chalet-restaurant Les Gélinottes is open all year. A unique opportunity to savour delicious mushroom dishes on a spacious terrace with breathtaking view. Every year in May, the famous Bol d’Or Henri Lloyd brings together many sailing boats on Lake Neuchâtel and attracts a great number of spectators. Amateur wine-makers are welcome to tastings of wines from the Yverdon-les-Bains region without appointment. The brochure "Accueil chez nos vignerons" (Welcome at our winemakers) provides details of opening hours for 14 winemakers producing Bonvillars and Côtes de l'Orbe appellations. Truffles not only grow in Italy and France. The soil in the Yverdon-les-Bains region, the main Swiss truffle area, is also suitable for this treasure of such delicate aroma. Heading out to discover this precious mushroom accompanied by keen and interesting guides is an experience offered to interested individuals and amateur truffle hunters. Mary-Laure Schorderet - independent chef de cuisine - suggests learning to cook this jewel of the Yverdon-les-Bains region. She teaches excellent recipes for preparing this mushroom and shows how to incorporate it in dishes and refine it. Dive into the heart of the Middle Ages; from only CHF 52 per person. Dans la Région d'Yverdon-les-Bains, les vignerons des appellations Bonvillars et Côtes de l'Orbe vous ouvrent leurs portes pendant 2 jours. Overlooking Lake Neuchâtel, a visit to the Bonvillars AOC vineyard promises exceptional views and unforgettable discoveries. In the charming village of Grandson near Yverdon-les-Bains and Lake Neuchâtel, Café du Commerce boasts a magical view on the second-largest medieval castle of Switzerland. Its cuisine without gluten and lactose pleases amateurs of healthy and tasty dishes. Located in the centre of Grandson, the restaurant “Chez Tony” offers traditional Sicilian cuisine. The Pécos Restaurant in Grandson is situated on the shores of Lake Neuchâtel enabling guests to enjoy lovely summer days. The Restaurant du Cercle de la Voile is a seasonal restaurant and coffee-bar, a privileged setting on the shores of lake Neuchâtel. L’Ecusson vaudois in Provence is one of the last country restaurants where you can enjoy simple, but delicious home-made meals. As its name says, the Bellevue Hotel in Onnens offers a pleasant view of Lake Neuchâtel, especially from its shaded terrace. The friendly restaurant offers fine terroir cuisine and a fireplace in winter. At only fifteen minutes from Yverdon, the renowned Auberge de la Couronne offers fine dishes, theme weekends and a cordial bistro atmosphere in the dining room or on the pleasant terrace. The Swiss terroir dishes offered at Hôtel du Lac et Gare invite visitors to the region to take a break in Concise. Its large sunny terrace on the shores of Lake of Neuchâtel offers a pleasant setting to enjoy the dishes and wines offered. 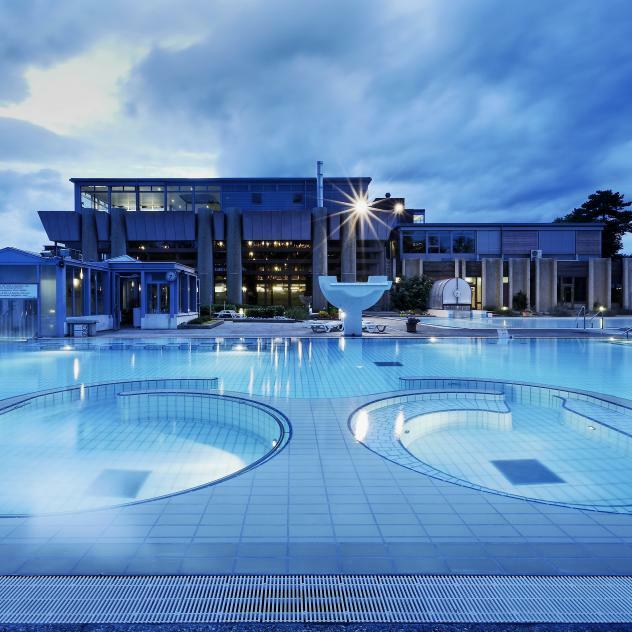 Memorable experiences at Yverdon-les-Bains Region’s most visited sites. Major events in the Yverdon-les-Bains Region.